Raise your hand if you have too much stuff. I’ve got both hands in the air, and while I appreciate every loved one who generously gifts me an object, my less-than-huge home is already bursting at the seams. An outing with Wanderlust Tours makes the perfect “experience” gift. That’s one reason I love the trend I’ve seen in recent years for gifting “experiences” rather than “objects.” If you’re ready to jump on that bandwagon, here are 33 amazing Bend experiences you can gift your loved one in 2018. An adventure with Wanderlust Tours. Let your recipient choose his or her own adventure with Wanderlust Tours. Offerings include snowshoe outings, cave tours, canoeing adventures, and more. A naturalist guide will provide all the gear and transportation, plus oodles of cool education about Bend’s ecology and geography. A gift certificate for a hotel stay in Bend. Whether your loved one favors luxury resorts, budget-friendly motels, cozy bed and breakfasts, upscale hotels, or vacation homes for rent, you’ll find tons of options to pick from in Bend. Check out our Bend lodging page for ideas! Something for the art lover in your family. The Workhouse is an awesome meld between art gallery, artist community, retail space, and educational facility, so there’s guaranteed to be something there for art lovers in your family. A gift certificate will let them pick between classes, goodies, or whatever else fuels their creative soul. 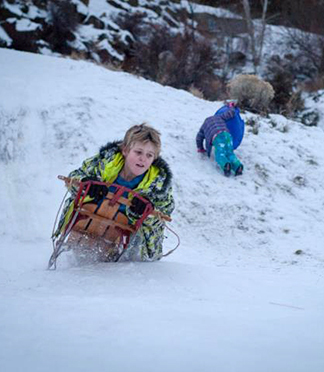 Get out and play at Sun Mountain Fun Center. My kiddos (ages 13 and 17) love the go-karts and bumper cars when the weather’s warmer, but you can keep it super cheap and just stuff a $5 Sun Mountain Fun Center gift card in each kid’s stocking. That’ll earn everyone a few video games and an entertaining diversion if you need something indoorsy for an hour or so. Give the gift of suds. Got a loved one who’s a beer fan? Every one of the 18 breweries that are part of the Bend Ale Trail offer gift certificates in any amount, so pick your fave and gift your favorite beer fanatic with a pint or twelve. The promise of summer fun with Sun Country Tours. Plan ahead for a summertime whitewater rafting adventure by nabbing a Sun Country Tours gift card. Their popular Big Eddy Thriller is only $59 for adults and $49 for kiddos 6-12. Old Mill gift cards and Downtown Dollars. Can’t decide what your loved one needs, but you want to make sure you’re supporting local Bend businesses? Grab a fistful of gift cards and gift certificates for the Old Mill District or Downtown Bend. You can buy them in all kinds of increments, and they’re good at nearly any store, restaurant, gallery, or theater in that shopping district. Can you say stocking stuffer? A massage gift certificate guarantees your loved one will have a relaxing time in Bend. The gift of relaxation. From facials to massages to pedicures to wraps, Bend’s day spas offer the full gamut of luxury spa treatments. Know someone who could use a little pampering? Check out our spa page for ideas on where to send your sweetie for a little R&R. Go jump off a bridge. Continuing our daredevil theme, my stepson got to enjoy the tallest commercial bungee jump in North America on his 15th He declared his leap from the historic Crooked River Bridge one of the coolest things he’s ever done. Buy gift cards for the daredevil in your life through Central Oregon Bungee Adventures. A cycling adventure with Cog Wild. One handy thing about a Cog Wild gift certificate is that the gift recipient can use it almost any time of year. Pick from their array of mountain bike tours during the warmer months, or when there’s snow on the ground, try one of their popular fat bike tours. An easier option for biking. Got a loved one who’d like to try biking, but with a little less effort involved? A gift certificate for an electric bike rental or tour should be just the ticket, and you can get one from Bend Electric Bikes, Let it Ride, or Pedego Electric Bikes. Bachelor gift certificates. You can buy Mt. Bachelor gift cards in any amount over $5, which gives your favorite snow bunny the freedom to choose from gear, lessons, lift tickets, and more. They can be purchased online, over the phone, or in person in the Gravity Sports Shop. Rev someone’s engine with a snowmobile outing. Know someone who craves a wintertime adrenaline rush? Central Oregon Adventures, Inc. offers two- and four-hour snowmobile tours leaving from Wanoga Sno-Park. Date night at a Bend restaurant. This is one of my favorite gifts to get. I love dining out, but it can be tough to justify the expense sometimes. Bend has an amazing array of restaurants to pick from, so snoop around to figure out the gift recipient’s favorite (or better yet, choose something special you know the person wouldn’t splurge on otherwise). A Sno-Park Pass guarantees your loved one endless hours of fun enjoying the wintery outdoor landscape. A gift certificate for a sled dog ride. Now THIS is a bucket list item! It’s a once-in-a-lifetime chance to take a dogsled ride with Oregon Trail of Dreams at Mt. Bachelor. The company is operated by Rachael Scdoris, the first legally-blind competitor to run the Iditarod, so these folks know what they’re doing. Stick around afterward and help feed and water the dogs. A NW Forest Pass, State Park Pass, or Sno-Park Pass. These handy permits are a necessary part of recreating in some of our most scenic spots, and they come with the added bonus of helping to maintain these wilderness areas. Choose from day passes, multi-day passes, or annual passes. We sell them all right here in the Bend Visitor Center. The chance to learn a new skill. Give your loved one a new skill he or she can use for years to come. Bend’s DIY Cave offers a variety of unique classes from welding to jewelry-making to woodworking to painting. Prices are super-reasonable, and there are even options for kids and parents to try together. A trip with Bend Jeep Tours. Is there someone in your life who’d enjoy the ultimate off-road adventure deep in the Deschutes National Forest? Guests will discover ancient lava flows, waterfalls, and a top-of-the-world view of the majestic Cascade Mountains. Go here to learn more. An all-terrain adventure with Outriders NW. Similar to the jeep tours above, but in a crazy-cool all-terrain vehicle that lets you explore towering Cascade Mountains, historic volcanic monuments, and the unique high desert environment. Good for families, groups, or individuals. You can learn more here. Wine and painting. You’ve seen the trend, and it’s available in Bend! Participants swill vino while learning to paint a cool scene. No experience is necessary, and Splash Wine Paint Create offers gift certificates. Tickets to an event at The Tower Theatre. Got a loved one who loves live performances in a cool, artsy venue? Check the schedule at Bend’s historic Tower Theatre and snap up some fab seats at an upcoming event. If you’re not sure whether to choose tickets for a musical performance, a film, or a theater event, just opt for a Tower Theatre gift card and let your loved one do the choosing. A gift certificate for Vector Volcano. Children of the ‘80s and ‘90s will fall in love with this quirky Downtown arcade packed with vintage video games. Vector Volcano is family-friendly, but they also serve local craft beer. Admission gets you unlimited game play for the time period you pick, with no quarters or tokens required. 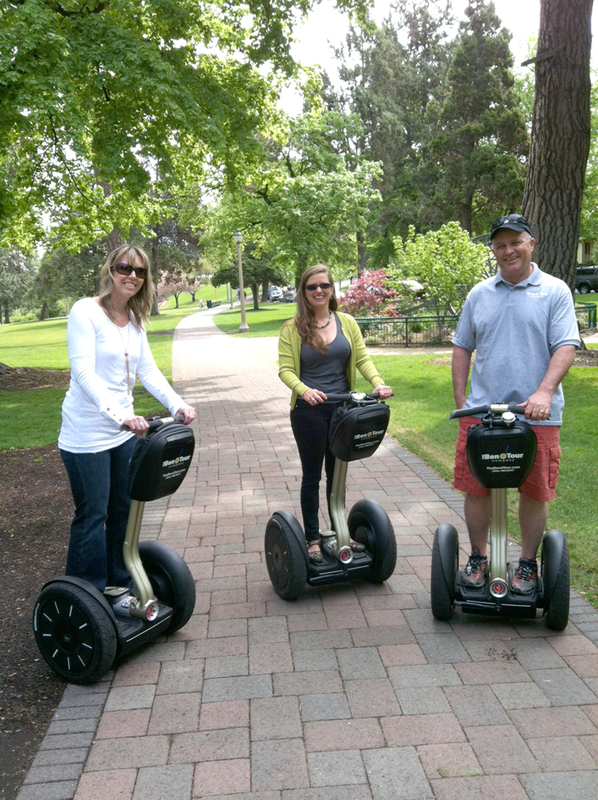 A Segway outing with the Bend Tour Company is a fun, unique way to see the city. Passes to the High Desert Museum. A favorite among families, the High Desert Museum is chock full of natural history exhibits and the coolest desert-dwelling animals you’ll find anywhere. I could spend hours just watching the otters, and with an annual family membership, your loved ones will be able to do just that! Visit their website to learn more about passes and membership. Get loopy with Central Oregon Aerial Arts. Got an aspiring circus performer in the family? Gift the family acrobat with a certificate for Central Oregon Aerial Arts. They offer professional aerial silks acrobatics classes with specially-trained instructors and oodles of safety precautions in place. Float your cares away. “Floating” is a wellness technique that involves slipping into a tank filled with about 11-inches of water saturated with Epsom salts. The buoyancy of the salt water keeps you afloat in water that’s heated to skin temperature, so you basically lose track of where your body ends and the water begins. It’s an incredibly cool experience, so let your loved one try it with a gift certificate for Easy Float. An adventure with The Bend Tour Company. Not sure if your loved one would prefer to scoot around town on a Segway, pedal the Cycle Pub, or cruise in a bus on the Art Safari tour? Pick up a gift card from The Bend Tour Company and let the recipient make the choice. Membership to the Deschutes County Historical Society. The history buff in your life will love having a membership that lets him or her scope out the Deschutes Historical Museum as many times as possible over the course of a year. Individual memberships start at just $20 for the year, so visit them online to learn more. Bounce ‘til you’re tired. Every parent knows the teeth-gritting drama of having an amped-up kid who’s been in the car too long. Help them get the wiggles out with passes to Mountain Air Trampoline Park or the brand new Trampoline Zone. Both spots offer tons of bouncy space, tumbling runways, games, and energy-burning fun for all ages. How about a gift card for the golf fanatic in your life? Bowling for the whole family. Bowling is the ultimate family activity for all ages, and Bend is lucky enough to have two great spots for it. Grab a gift certificate for Lava Lanes or Sun Mountain Fun Center and tuck that bad boy in your pal’s favorite bowling shoes. Get someone teed off. Central Oregon is home to more than two dozen golf courses, including several ranked among Golf Digest’s top courses. Pick one that piques your interest and snag a gift card for the golf fan in your life. Let your family “escape” together. Last Christmas, my family visited Bend Escape Room for the first time and loved it so much we’ve already scheduled another Christmas Day outing. Both Bend Escape Room and Red Button Escapes are fun, immersive, interactive game experiences in which your whole group is locked in a room and given the clues to escape. There’s also a brand new Escape Room on Wheels in which participants must find their way out of Ole Pappy’s Trapper Cabin. A Brew-It-Yourself session at Immersion Brewing. Got a craft beer fanatic in the family who’d like to try his or her hand at brewing a special batch of suds? Immersion Brewing offers Brew-It-Yourself workshops with a professional brewer. The session includes all ingredients, bottles, caps, custom labels, and approximately five gallons of your very own craft beer.